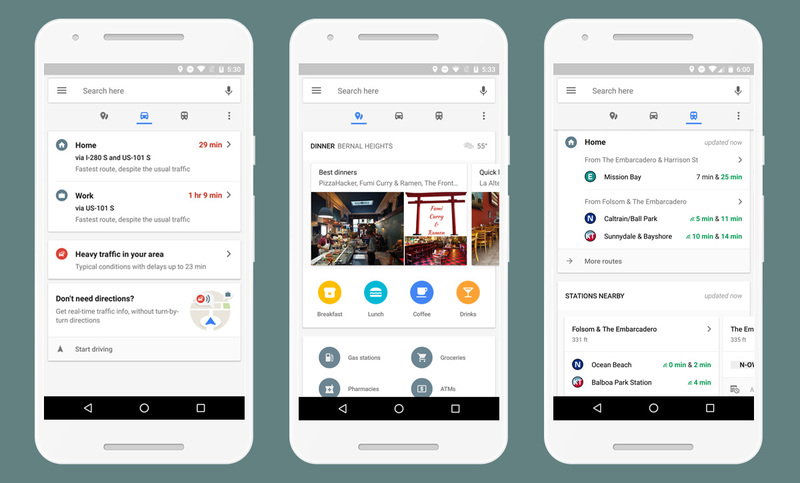 An update is rolling out to Google Maps users on Android today that provides real-time information as you make your morning and afternoon commute. It’s a new toolbar with 3 tabs that is accessed with a swipe to show you nearby places, details on your travel time, and a transit tab, should you choose not to drive. You can see the tabs display in the image above, in case that description didn’t make sense. You have a tab for nearby places, one for your commute as a driver, and one for transit. The places tab gets you into choices like “best dinners,” “cheap eats,” or “business dining,” along with shortcuts for ATMs or grocery stores or gas stations. The driving tab displays your work and home addresses, along with ETAs, so you can quickly figure out the best way to get to work or home or when you might need to leave. And finally, the transit tab gives recommendations for which bus or train you should take to get to your next spot. Again, the update with this new commute bar is rolling out today.